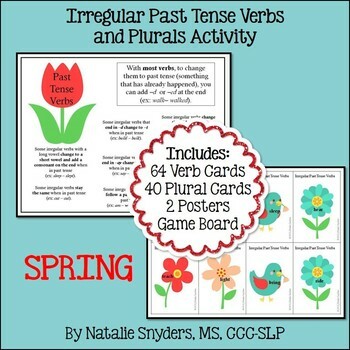 This product is a bundle of the following three products: Fall Irregular Verbs and Plurals Activity, Winter Irregular Past Tense Verbs and Plurals Activity, and Spring Irregular Verbs and Plurals Activity. By purchasing the bundle, you will save 15% off the individual purchase price of each product. 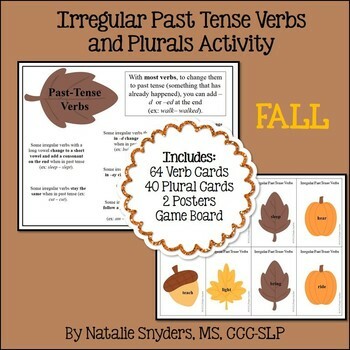 Each 16 page seasonal activity includes 64 irregular verb cards, 40 irregular plural cards, 2 explanation posters, and one open-ended game board. 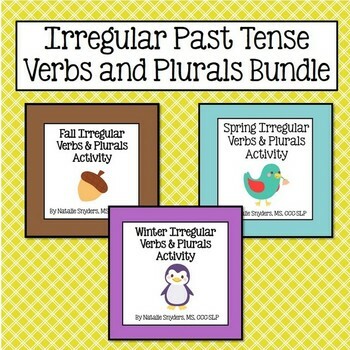 PLEASE NOTE: All of the stimulus words are the same in the fall, winter, and spring activities. As with all of products in this store, this is copyrighted by Natalie Snyders. 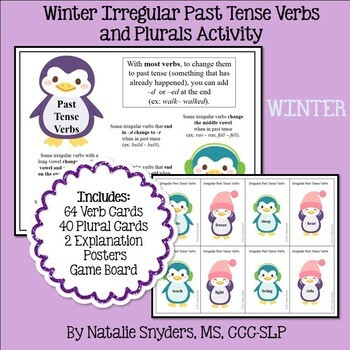 Purchase of this item entitles you to use this in your own classroom/therapy room/SLP assignment only. Copying for other professionals, sharing the file directly via the internet, or re-selling of this item is strictly prohibited. Please direct others interested in using it back to the original source (this page) or purchase a multi-user license.